A study set is a two page, 8.5” x 11” PDF of a specific plan from our collection that includes the full-color elevation, floor plan, and description. If you know which plan or plans you are most interested in, we recommend purchasing a study set so you can have a physical, visual printout of your dream home—something you can pin up and start getting familiar with. This is an affordable way to help you evaluate the plan closely to see if you’d prefer any changes and to inspire you as you embark on the journey of building your new home. If you have several plans that you’re interested in studying, or if you’re just getting started with browsing for your ideal home, we recommend purchasing one of our plan books instead. Of particular interest to you might be The Complete Collection Volume 1 and/or The Complete Collection Volume 2 (coming soon, subscribe for updates!). Every plan available on our website will list the plan collection it is included in, and our books are available through Amazon. PLEASE NOTE: The study sets are not to scale and are not construction documents. What is a Plan Book? There are many different types of plan books, but ours are unique in that we mostly focus on concepts, providing an excellent customizable and creative jumping-off point so you can find something that is distinctly you. 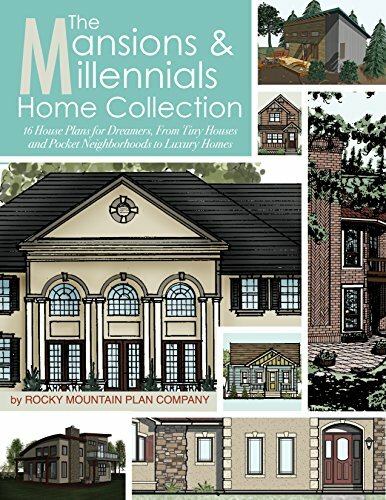 We offer several Plan Books showcasing our collection of homes for your perusal. Because there are so many facets and options to consider when you start thinking about building your dream home, we find that one of the best ways to know what you like is by browsing and studying many plans in order to learn exactly what you want and need to fit your lifestyle. That’s why we put together our plan collections, sold as beautifully illustrated books. 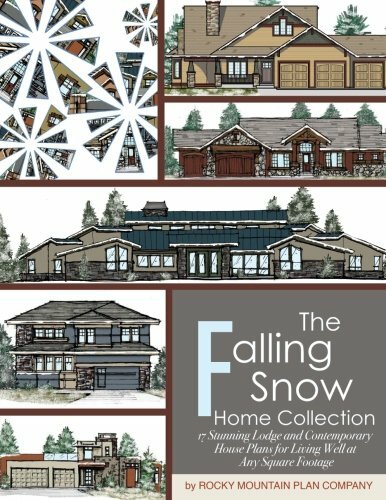 The plan books include all the information from our mini study sets—colored elevations, floor plans, plan descriptions, and basic details—along with features and articles on architectural styles, accessibility, and sustainability. Of particular value are The Complete Home Collection Volume 1 and The Complete Home Collection Volume 2 (coming soon, subscribe for updates! ), both of which contain over 100 plans for your consideration. What is a 1/8” Scale Concept? 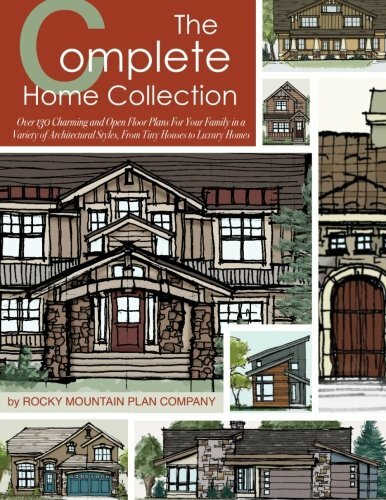 At Rocky Mountain Plan Company, we prefer to offer our house plans as scaled concepts, rather than sell the complete plans, because we want you to have the home of your dreams, and that often means making adjustments, whether they be garage modifications to better fit the specific lot you have purchased, or adding or adjusting rooms to suit your preference. Making changes of any kind is much easier and far more cost effective when done at this scaled concept level, rather than when structural adjustments must be made to construction documents, and they will also deliver a better result. Too often, we’ve heard of clients who have purchased a set of plans from a different company, intending to save money, only to incur extensive fees when an aspect of a plan must be redrafted in order to meet varying city codes. Or, if a seemingly small change is requested by the client to, for example, make the master suite a couple feet larger or make the garage smaller, this will often necessitate reconfiguring much larger aspects, like the roof or structural details, and the unforeseen costs of these modifications can add up quickly. By offering our 1/8” scaled concepts, we hope to offer a sensible middle ground—a jumping off point intended to save you time and money and ensure that no efforts or dollars are wasted. Because the 1/8” home concepts we sell are to scale, these PDFs can be printed off and taken to any drafter, building designer, or architect in your local area, and they will be able to help you best position the home on your specific site, make any changes you might desire, and assist you in complying with any local building code requirements before drafting the full construction documents. PLEASE NOTE: The 1/8” scale concepts are to scale but are NOT construction documents. The drafter of your choice will still need to create these in CAD or Revit with any desired modifications in order to be usable. 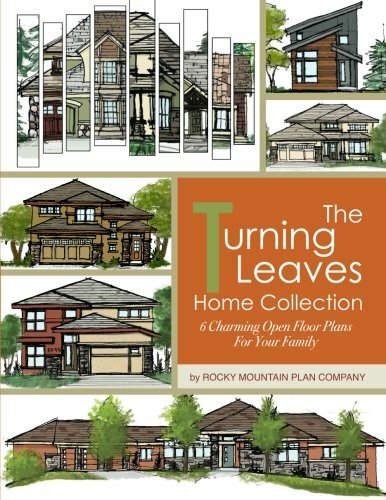 If you do not require any changes to the plan, or if you’d like to have us make the modifications for you, Rocky Mountain Plan Company does sell PDFs suitable as Bid Sets for many of our plans, and we also have a talented team of drafters and designers who can work with you to modify or customize any plan to create the home of your dreams. Should you choose to have Rocky Mountain Plan Company provide the Bid Sets or customize a plan, we will deduct the price of the 1/8” scale concept from your total invoice. Please get in touch with us to talk about your vision and to receive a quote. Perhaps you will find a home in our plan collection that is simply perfect for you in every way, but what if you fall in love with a floor plan, only to realize the architectural style is not what you personally love? Or what if the home is almost perfect but you have aging parents or in-laws to consider, and you’d really like to add an accessible suite for them over the garage? It’s for instances like these that we’re proud to offer our mini charrette services through LGA Studios. After you select a plan or plans that interest you and determine your needs and wants, we can set up an initial meeting—either in person at our offices in Colorado Springs, or via video chat—and we’ll listen to your ideas and vision in order to get to understand your lifestyle and exactly what you want. From this dialogue, we’ll create the framework of your home design through felt tip pens and sketch paper, consulting with you through every phase to ultimately deliver the home you have been dreaming of. Please get in touch with us to talk about your vision and to receive a quote. We recently worked with clients who loved our Blue River floor plan, but were passionate about contemporary design. The original plan features a lovely lodge style exterior, but, with just a couple hours, a felt tip pen, and the imagination and experience of our drafters, we delivered a brand new contemporary exterior that keeps the floor plan our clients loved intact, but now perfectly suits their more modern aesthetic. Absolutely! Our team of designers come to the table with decades of experience in residential design and building. Our collective passion is to spread the practice of good design and to create homes that make people happy, and we have extensive experience in conceptualizing communities, green building, and custom construction. We can find or develop innovative floor plans based on any criteria, from floor plan style, to footprint size, to square footage, and we can customize your favorite plan with a variety of elevations, providing your clients with the architectural style they crave. We will open our portfolio of hundreds of floor plans to you for your perusal, and we can help you find or design homes that suit your goals, whether it be attracting new clients or developing a new subdivision or pocket neighborhood. Please contact us for a custom quote to discuss the possibilities. Do you work with developers, builders, or realtors?